Bernese Mountain dogs and Papillons, our great passion. We (Ger, Cora and Kelly) are a family of 3 with a passion for animals. 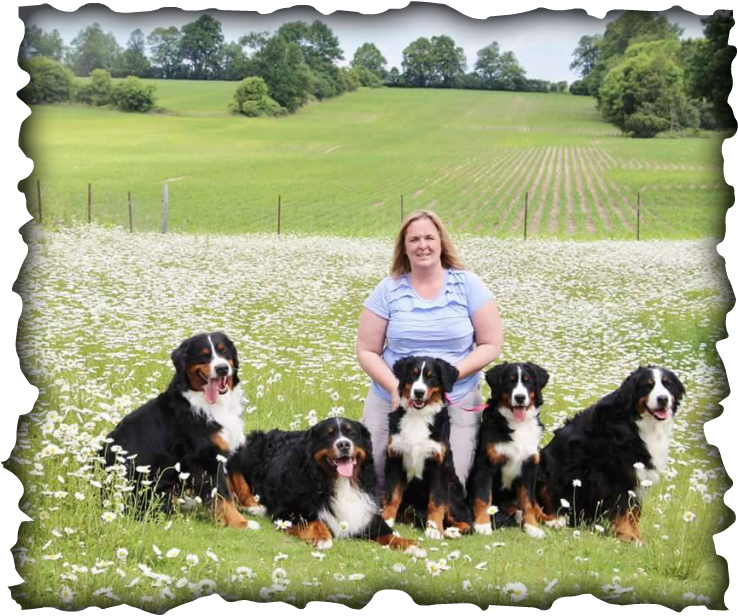 We are the proud owners of Bernese Mountain Dogs since 1993 and Papillons since 2004. When we emigrated from Holland in 1999, we had a dream! That dream was to live on a hobby farm with lots of animals, such as horses, alpacas, birds and especially dogs. We came to Canada with 3 Bernese Mountain Dogs and our daughter Kelly wanted a small dog as well. After lots of research, we came across the Papillon dog. Shortly after, Ger came home with a tiny papillon puppy. We were sold! The Berner and the Papillon are the breed for us! The character of the Papillon is so close to the Bernese Mountain Dog. Both dog breeds are loyal, eager to please and true companion animals, even though the Bernese Mountain Dog is a working dog, his main goal in life is to stay close to his human. Both breeds love to go on long walks, and do agility. Our Bernese and Papillons get along very well! All our dogs live in the house with us and a few found a good home for various reasons with close friends but come home to be shown and bred. Breeding healthy, long living dogs is our goal and we go through great length to try to achieve this goal! We are on our third generation raw fed dogs and the health improvement is significant. We don't sell dogs to just anybody, we like to get to know you and build up a relationship. This will ensure us we can follow the pup through its life with you and for you it means we are always here to help you whenever needed! Raising our pups naturally means that we feed and recommend a raw food diet for optimum health, nutrition which give optimal development. We believe in limited vaccines, holistic treatments and no heartworm,flea and tick preventatives. We expect future puppy owners to adhere to these same believes. Please visit the health section of our website for lots more information. Please feel free to contact us to come meet our dogs and see for yourself what we are all about! ​I am a member of the Canadian Kennel Club, The Bernese Mountain Dog Club Of Ontario and Papillon Canada! By profession I am a nurse and when my first 3 Berners passed away I became obsessed with health and especially nutrition for small animals specifically dogs. I found that Dogs Naturally is well researched and I became part of their certification program. This is an ongoing study and I am proud to have received the Pet Food Nutrition Specialist badge!